Mataio Kekūanāoʻa (1793–1868) and Kīnaʻu (1805-1839) each served as Kuhina Nui, a position generally described as “Prime Minister,” “Premier” and “Regent.” They were each born of chiefs; Kekūanāoʻa was son of an Oʻahu chief; Kīnaʻu was the daughter of Kamehameha I. They were also husband and wife. We do not often hear about David Kamehameha. Some suggest David’s birth had helped reconcile differences between Ka‘ahumanu and Kīnaʻu. It was the wish of Kamehameha the Great that Kīnaʻu and Kamāmalu, his daughters by Kaheiheimalie, marry his sons by Keōpūolani, the highest ranking chief of the ruling family in the kingdom during her lifetime, to continue his line. Hiram Bingham noted David Kamehameha was “the favorite little son of Kekāuluohi;” although it is likely Kīnaʻu still had a hand in his upbringing. Prince David Kamehameha died of unknown causes at the age of seven, December 15, 1835. He was buried at Pohukaina on what is now the ʻIolani Palace grounds and was later transported and buried at the Mauna ʻAla Royal Mausoleum. On November 16, 1836, High Chief Kahana Kapaʻahea and the High Chiefess Analeʻa Keohokālole had their third son, David Kalākaua; it has been suggested that he was named in honor of David Kamehameha. The image shows a portion of the Kamehameha family tree. In addition, I have added other images in a folder of like name in the Photos section on my Facebook and Google+ pages. Mataio Kekūanāoʻa (1793–1868) and Kīnaʻu (1805-1839) each served as Kuhina Nui, a position generally described as “Prime Minister,” “Premier” and “Regent.” They were each born of chiefs; in Kīnaʻu’s case, she was the daughter of Kamehameha I.
Moses Kekūāiwa was born July 20, 1829. His hānai father, Kaikioʻewa, was a trusted and loyal advisor and warrior to Moses’ grandfather, Kamehameha I. When Kamehameha died, Kaikioʻewa was one of the few there with him. Moses Kekūāiwa was educated at Chiefs’ Children’s School (Royal School.) Founded in 1839, the original school was located on the grounds of the present Hawaiʻi State Capitol. The school was created by King Kamehameha III; the main goal of this school was to groom the next generation of the highest ranking chief’s children of the realm and secure their positions for Hawaii’s Kingdom. Amos Starr Cooke (1810–1871) and Juliette Montague Cooke (1812-1896), missionaries from the American Board of Commissioners for Foreign Missions, were selected by the king to teach the 16 royal children and run the school. In this school were educated the Hawai‘i sovereigns who reigned over the Hawaiian people from 1855: Alexander Liholiho (King Kamehameha IV,) Queen Emma, Lot Kamehameha (King Kamehameha V,) King William Lunalilo, King David Kalākaua and Queen Lydia Lili‘uokalani. In addition, the following royal family members were taught there: Princess Bernice Pauahi Bishop, Princess Elizabeth Kekaʻaniau Pratt, Prince Moses Kekūāiwa, Princess Jane Loeau Jasper, Princess Victoria Kamāmalu, Prince Peter Young Kaeo, Prince William Pitt Kīnaʻu, Princess Abigail Maheha, Prince James Kaliokalani and Princess Mary Polly Paʻaʻāina. Moses Kekūāiwa, the eldest male of his generation and a lineal descendant of Kamehameha I, was expected to marry a high chiefess of rank to continue the royal line. However, she arrived too late to be wed Moses. In September, 1848, someone infected with measles on an American warship arrived. It spread and killed about a third of the population. A notice in the newspaper noted the sad news, “DIED – In this town, on Friday, the 24th, inst., Moses Kaikioʻewa, son of Kekūanāoʻa and Kīnaʻu, aged 19 years and 6 months. The deceased was the expectant governor of Kauaʻi, and was educated at the Royal School.” (Polynesian, November 25, 1848) Moses Kekūāiwa is buried at Mauna ʻAla. 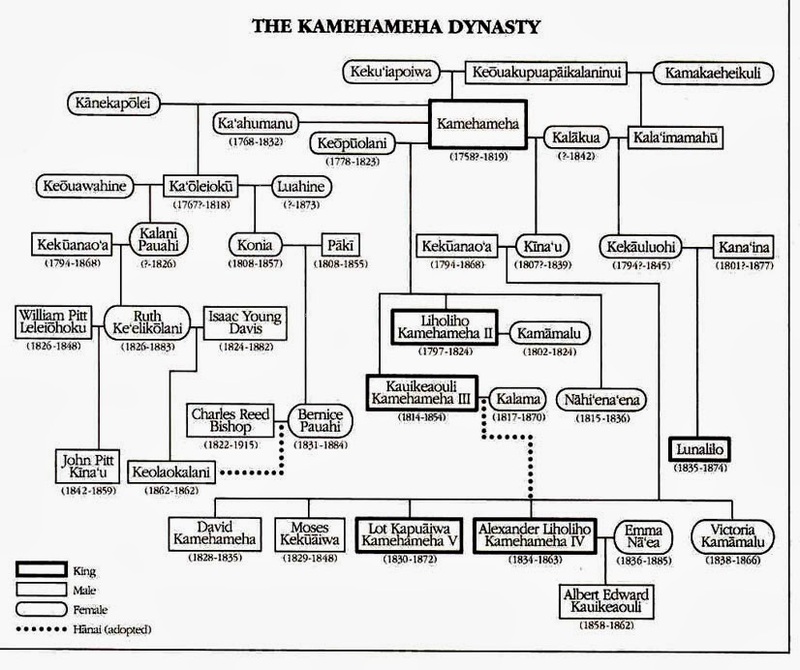 The image shows the Kamehameha dynasty (ksbe.) In addition, I have included other images in a folder of like name in the Photos section on my Facebook and Google+ pages.